Wild mustard weed stands on thick stalks ranging from 6 inches to 3 feet in height, with branching stems topped by bright yellow clusters of four-petaled flowers. 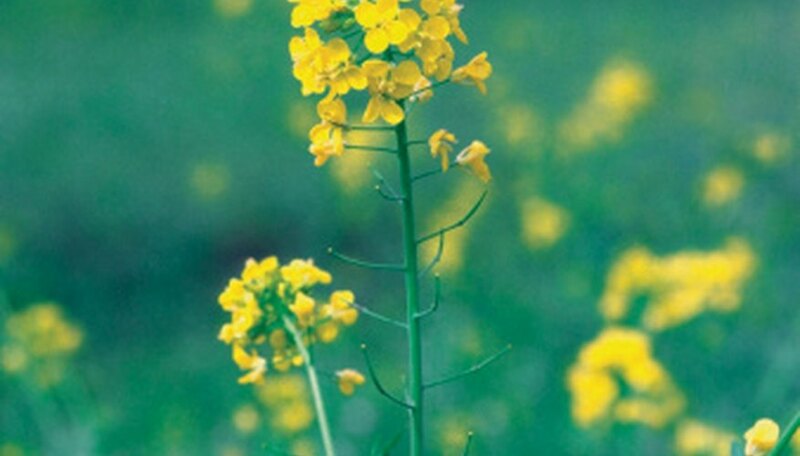 Found in fields and along roadsides, wild mustard weed spreads rapidly and can cause significant damage to field crops and livestock if not effectively managed. Mustard weed is an aggressive annual grower that appears in most temperate zones around the world. A broadleaf plant, mustard weed has a large, fibrous tap root, and, once mature, the stems develop their bright yellow flower clusters that begin to lengthen as multiple seedpods develop on the weed. Often seen in garden center pots, the kidney-shaped seedlings develop into unevenly shaped leaves with wavy edges. New leaves are bright green at the top of the plant and a lighter shade below. Upper leaves on mature plants are small and branchlike, while the leaves at the base of the plant are larger and sit close to the ground. Mustard weed seedpods hold 10 to 18 seeds each, and the entire plant develops up to 3,500 seeds. Grown only from seed, newly spread seed will produce a mature plant within three months, and seeds that scatter can survive and remain viable for up to 60 years. Early removal of wild mustard, before seed pods develop and shatter, is essential to reducing the spread of the weed. Mustard weed infests fields, reducing both the crop yield and crop value, and causes digestive and thyroid problems when consumed by livestock. Animals that ingest excessive amounts can develop wild mustard seed poisoning and may not survive the effects. Many insect pests and diseases also infest mustard weed, which in turn may cause even further crop damage. Large-scale removal of seedlings is difficult, because wild mustard germinates at the same time spring planting occurs; but many chemical options are available, if needed. In the home garden, remove wild mustard weed at the seedling stage to prevent seedpod development and the spread of wild mustard weed into other parts of the garden.